When you use your Internet explorer in Windows 7, Windows 8.1 or Windows 10, you have the feature to delete your internet history as well as a multitude of others settings that allow you to manage the cookies stored in your web browser. 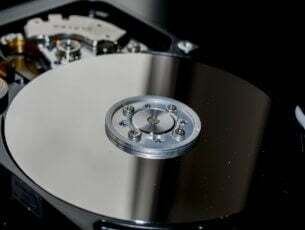 Some Windows 8.1 or Windows 10 users want to prevent the internet history from being deleted. 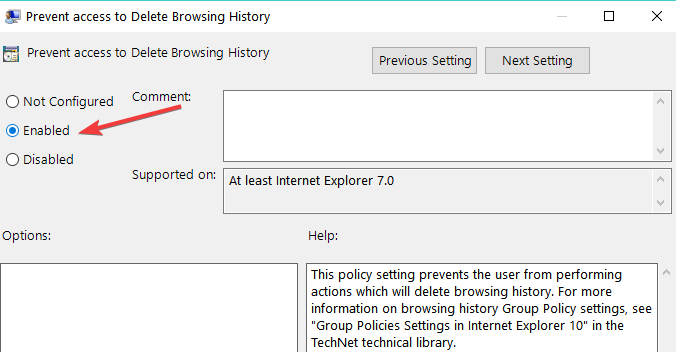 If you feel the same and you want to prevent users from deleting Internet Explorer browsing history, then follow the instructions below for a quick understanding on how you can do that. 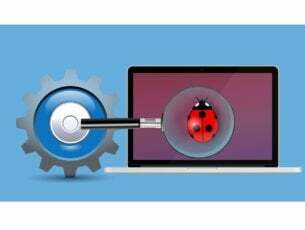 Stopping users from deleting the internet history as well as other features in your browser can be done by accessing the Group Policy Editor. You can then change the restrictions from there. So for accessing this feature and making the necessary modifications, follow the steps below. Press and hold the “Windows” button and the “X” button on the keyboard and select the “Run” feature. Note: Another way to access the “Run” window is the press and hold the “Windows” button and the “R” button. Write in the run box the following: “gpedit.msc” without the quotes. Now you should have the “local Group Policy Editor” window in front of you. Double click or tap on the “Computer Configuration” folder situated in the left side list in the window. In the “Computer Configuration” folder double click or tap on the “Administrative templates” folder. In the “Administrative Templates” folder double click or tap on the “Windows Components” folder. 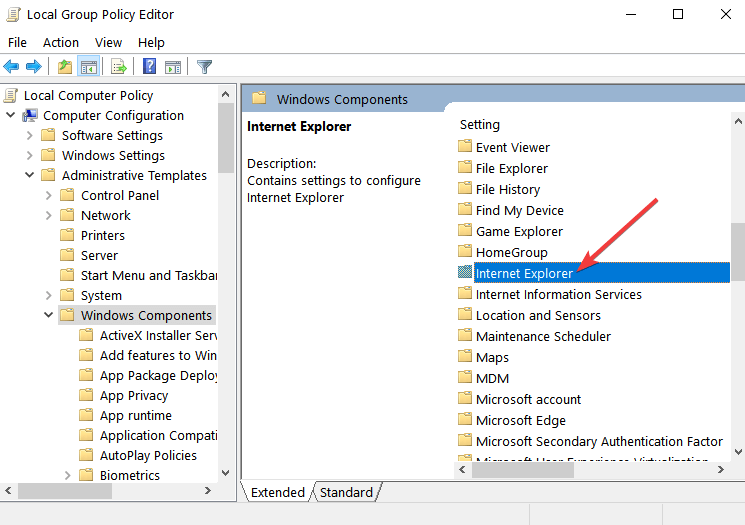 In the “Windows Components” folder double click or tap on the “Internet Explorer” folder. Now double click on the “Delete Browsing History” folder inside the “Internet Explorer” file. 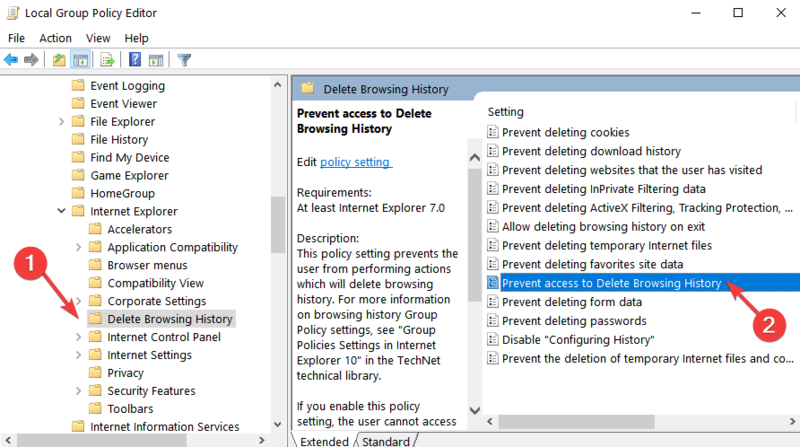 You should have on the right side in the “Local Group Policy Editor” window the “Prevent access to delete browsing history” option. Double click or tap on the “Prevent access to delete browsing history” option to open it. Check the “Enable” feature in that window. Left click or tap on the “Apply” button in the lower right side of the window. Left click or tap on the “OK” button afterwards. Reboot your Windows 8.1 or Windows 10 device and see if another user except the administrator can delete the Internet History. You can also prevent users from deleting forms and passwords. The steps to follow are similar to those listed above but instead of selecting the option “Prevent access to delete browsing history”, you need to select the ” Forms” and “Delete Passwords” functionalities. There you go, a simple way on how to stop users from deleting internet history in Windows 7, Windows 8.1 and Windows 10. For any other additional questions or suggestions on this subject, use the comments section below. We will help you further as soon as possible.